Keeping track of employees can be difficult no matter what size team or business one operates. The Excel Employee Vacation Tracking Calendar Template can help immensely by allowing managers and shift captain to easily keep track of who is where, and make sure that every employee is fairly allocated vacation time. Even those who aren’t familiar with Microsoft Excel, this template is straight forward and easy to use. Fully customizable, the template allows anyone to choose a key to better identify absences and their reasons or change the date and time structure to better reflect how a specific business operates. When using a standard pen and paper calender or ledger book, it is easy to make mistakes and even harder to correct them. Excel documents “roll-up” so any changes made will distribute evenly throughout the spreadsheet. Dates correspond to the actual calender allowing for a natural time sheet progression. The Excel Employee Vacation Tracking Calendar Template is the latest version. You can add or remove as many employees as you need to. 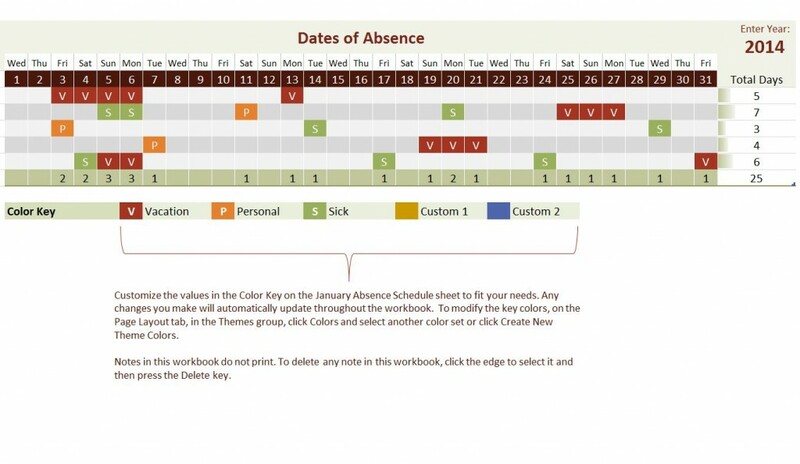 Easy to mark absences, just change the value of the employee’s box on that day or mark ahead. 100% free and easy to download the Excel Employee Vacation Tracking Calendar Template. For billing purposes, it is best to be as specific as possible with what kinds of absences employees take. A common practice is to mark sick days, vacation days, and personal days. No one wants to take away an employees vacation day when they want it most. The Excel Employee Vacation Tracking Calendar Template is fully customizable, change it to suit your business better, or even add other worksheets in to extract more value out of the data. Other absences can exist. When an employee is at a conference or on a business trip— even if they are on the clock it helps to mark them as absent if they aren’t physically present. For those who don’t like to interact with digital media, print out the time sheet and leave it up for employees to mark with pen and paper. At the end of the day update the vacation tracking calendar on the computer. Print out a new schedule and repeat. Thanks, this spreadsheet has been very helpful to me.